Your online receipt is your ticket so please bring to the gate to exchange for your wristband. This is a rain or shine event and all ticket sales are final - no refunds/exchanges will be given. See you at the festival! Your receipt is your ticket. When you bring that to the gate you will receive the appropriate wristband. This is a rain or shine event and all sales are final - no refunds/exchanges. We're looking forward to a great festival this year featuring acoustic, traditional, Americana and Bluegrass with plenty of parking lot and campground picking. Tell your friends about us and share our event on your social media platforms. See you this summer! 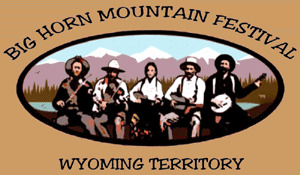 The Big Horn Mountain Festival is an annual three day music festival featuring acoustic, traditional, bluegrass and Americana music. Showcasing national and regional talent on two stages, the event also hosts numerous workshops. RV and tent camping is available on site and one of the great features of the festival is the parking lot and campground picking that goes on during the festival and late into the night, so bring your instruments! A variety of great food vendors will be on site and craft and domestic beer will be available.